Updated 3:35 p.m. | Posted 12:42 p.m.
Minnesota DFL U.S. Rep. Ilhan Omar is under fire for Twitter exchanges that Democratic allies, along with Republicans and Jewish organizations, are condemning as hateful and anti-Semitic. That criticism intensified Monday afternoon as House Speaker Nancy Pelosi and other top House leaders condemned the remarks and called on Omar to "immediately apologize for these hurtful comments." 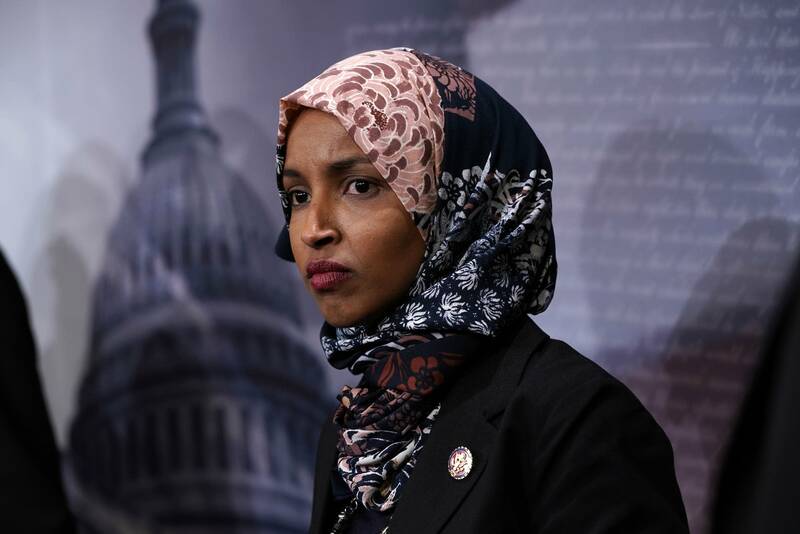 The controversy began Sunday night when Omar responded to a tweet from journalist Glenn Greenwald taking House GOP Leader Kevin McCarthy to task for threatening punishment against Omar and Michigan Democratic Rep. Rashida Tlaib over their criticisms of Israel. "It's stunning how much time US political leaders spend defending a foreign nation even if it means attacking free speech rights of Americans," Greenwald wrote. Omar responded: "It's all about the Benjamins baby," followed by a musical note emoji. The line comes from a 1997 Puff Daddy rap song referring to $100 bills. The tweet was immediately criticized as being anti-Semitic, implying Jewish Americans use money to influence a sympathetic U.S. foreign policy toward Israel. In a subsequent tweet, Omar was more specific, suggesting it was funding from "AIPAC," the American Israel Public Affairs Committee, a prominent pro-Israel group, fueling Republican support for Israel. The backlash was swift. Freshman Democrat Rep. Max Rose, from New York, tweeted her comments were "deeply hurtful to Jews." The chair of the House Judiciary Committee, Rep. Jerry Nadler, D-N.Y., issued a similar statement, and other Democrats weren't bashful in calling Omar out. Chelsea Clinton said elected officials should "not traffic in anti-Semitism." It's not the first backlash the freshman from Minneapolis has faced during her short tenure in Congress. But so far, Minnesota Democrats are saying little in response to the controversy. The Minnesota DFL Party declined to comment on the tweets. Fellow first-term DFL Rep. Angie Craig, who was at the Minnesota Capitol on Monday, said she would let her House colleagues "speak for themselves." "I certainly support a strong and safe Israel as the only democracy in the Middle East and I'm going to continue to do that," she said. "I've decided I'm going to speak for myself and let others speak for themselves and we'll let the voters react to that." Other Minnesota groups were critical of Omar. Steve Hunegs, executive director of the Jewish Community Relations Council of Minnesota and the Dakotas, said her assertion that Jewish groups "manipulate government with money invokes age-old anti-Semitism." After Omar apologized Monday afternoon, Hunegs said "actions will speak louder than words" going forward. "We hope she will have learned from this situation," he said. "We want to have a respectful working relationship with her. We'll see going forward if she's going to continue in this vein of being more careful in the words she chooses." Her comments, though, remained a sore point for state Sen. Ron Latz, DFL-St. Louis Park, who criticized her for "clearly anti-Semitic public statements." Omar, he added, "cannot constantly make statements that suggest she was 'ignorant' of the anti-Semitic implications of what she says or publishes, as she has been educated by myself and others on numerous occasions." Omar has been openly critical of the Israeli government over its treatment of Palestinians and is part of a movement calling to cut economic ties with Israel over Israeli occupation of the West Bank. She also recently came under fire for a 2012 tweet where she said Israel had "hypnotized the world" and accused them of "evil doings," words that Hunegs warned were outside the bounds of politics and put Jewish people in danger. Minnesota Senate Republican Majority Leader Paul Gazelka also condemned Omar's rhetoric. "It's a combination of quotes she's made over the last year that I just decided I'm going to take a stand and say it's not OK," Gazelka, R-Nisswa, said prior to Omar's apology Monday afternoon. "I'm going to support Israel and the Jewish people," Gazelka added. "I think somebody needs to when somebody on the other side continues to say something negative." McCarthy, the GOP leader, has been critical of Omar and other Democrats' comments about Israel, calling them anti-Semitic. The Republicans recently punished one their own, Iowa U.S. Rep. Steve King, for comments questioning when language like "white supremacist" became offensive.